If you are living in a region where summer is long, hot and dry, growing moisture loving plants like ferns or air plants can be a bit tricky. However, there are several quick and easy ways to maintain appropriate level of humidity for your plants and keep them healthy and happy in hot and dry summer. Summer in the region where I live is harsh and dry (reaching 104 – 116 ◦F) but I still manage to keep several moisture loving plants including Tillandsias that require higher level of moisture. Group moisture loving plants – Grouping plants with similar requirements tightly creates a micro climate for these plants. This micro climate can retain most of the moisture lost due to evaporation from soil and leaves of these plants. Most plants, when grouped together, would respond positively and grow healthier in their micro climate. Mist them regularly – Plants that are sensitive to hot and dry climate benefit from regular misting. I use spray bottle to mist sensitive plants several times a day. 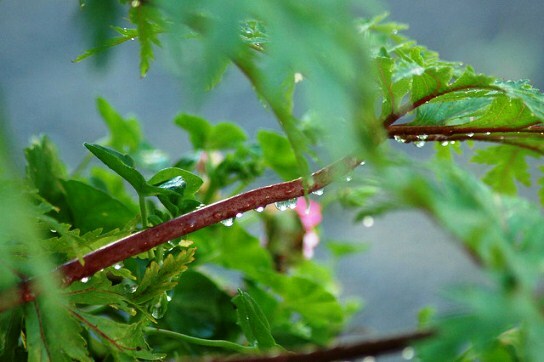 Always avoid misting flowers while spraying your plants. Use self-watering pots – This is quite easy and time-saving technique. If you are too busy to attend to your moisture loving plants, transfer them self-watering pots. These pots have attached water reservoirs, which helps creating a humid climate around the plant. Place them in bathroom – Bathroom is usually the most humid room in the house. During long spells of hot and dry summer, I place my air plants in bathroom where they benefit from higher level of moisture. Use non-porous pots – Most of my plants are potted in terracotta pots, however, plants that require humidity and moist soil are grown in plastic pots. This is an easy way to slow down evaporation process and keep the soil moist. Use moisture retaining shell – If it is not possible to move or group your container plants together, an effective way of retaining moisture is placing the container inside a bigger container and then filling the outer ‘shell’ with coco peat or peat moss. Now every time you water your plants, add some water in the outer shell. The peat would retain moisture and maintain good level of moisture for your moisture loving plants.